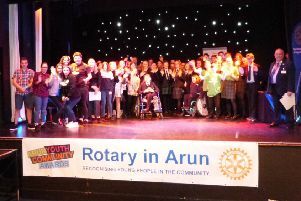 Young people’s exceptional achievements, supporting and helping others, have been recognised and rewarded at the Rotary in Arun Youth Community Awards for a fifth year. Four Rotary clubs, Arundel, Bognor Hotham, Bognor Regis and Littlehampton, work together on the awards to acknowledge and celebrate the wonderful work of young people from across the Arun district. This year’s awards received the largest number of nominations so far and the clubs are determined to continue to develop this annual celebration of young people’s achievements. The 2019 awards ceremony took place at a completely full Windmill Theatre in Littlehampton, where representatives from the four clubs presented certificates to 31 individuals and five groups, between them totalling a further 30 young people. Rotarian Peter Stemp said: “All the nominees had shown themselves to be exceptionally caring, especially brave, or generously giving of their time to volunteer or raise money for charity. “The nominations were given to the Arun Youth Council, who had the difficult task of selecting a winner in each of the three age categories and the one group category. “The winners received a trophy and gift token in recognition of their outstanding achievements. Performers included Lisa Lo, a four-piece band from Northbrook MET, plus vocalists Amelie Ashtyn, Amelie Beauchamp and Ashtyn Roworth, and violinist Harry Ward, all accompanied by Marilyn Hurdwell. Arun Young Leaders, The Angmering School’s Rights Respecting Ambassadors, The Angmering School’s Cookies on Call team, Felpham Community College’s Holocaust Memorial team and The Regis School’s Green team.